Jan Toorop (1858-1928) was a Dutch painter who made, among many other subjects, drawings of people in working situations. 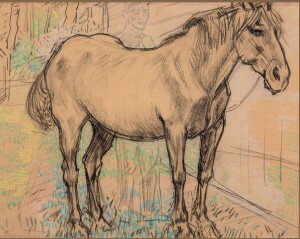 He rarely used animals in his works, but here he has made an impressive portrait of a common working horse. Behind the horse the farmer is visible as a sketch. All attention goes to the relaxed head and the massive body of the horse. This impression is reinforced because the horse covers the whole picture. We can consider this horse as a an example of the Zeeland horse, which is the Dutch version of the Belgian draught horse. There were many famous breeders of this heavy horse in Zeeland. Jan Toorop spent many summers in Domburg (island of Walcheren, province of Zeeland) and we may assume this drawing was made there. The drawing has the annotation ‘aan Spoor’, which must refer to the narrow gauge track (1067 mm) between Middelburg and Domburg, which was built in 1905, became operational in 1906 and was suspended in 1937. On the right the track is visible, giving this work a topographical and historical aspect.